This layout has since been dismantled and I haven't actually built a new one yet. Click Here to see another project that I've done. CRR #915 switching the north end of Kingsport yard at MP# 93. Even though there was never a engine shed in Kingsport, TN. here's my engine facility. Extra South #3601 has a green while #94 is a SB Time Freight on the main passing by the Kingsport switcher. Train #92 is clear through Kingsport, TN while passing Metro Gas in Rotherwood, TN. Looking North at Rotherwood, TN. where Metro Gas (propane) is located just outside of Kingsport. A Southern GP35 is shoving a car into the Tennessee Eastman complex. 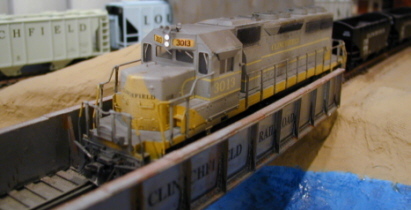 Southern had trackage rights over the Clinchfield from Frisco,TN. You can see a small portion of Carter yard which was a piggy-back yard mostly for Tennessee Eastman. In the back ground you can see Penn-Dixie Cement Corp. Looking at the Industrial area you can see several buildings. Mead, Kingsport Freight Terminal, with Eastman in the back ground. An overview of the whole Kingsport area with a few pictures on the wall of the Clinchfield area which is now part of CSX Transportation. Here a local is heading South out of Kingsport toward Erwin, TN. You can also see one of Tomar Industries fine signals to the right that's in operation. Looking South at the Feldspar plant that is located on the southern end of the railroad just before heading into staging. Ducking into Bear Pen Gap tunnel you can see the 1st. Moss Turn pulling some loaded coal cars out of Victor Tipple in Southwest Virginia. Slightly under powered but due to the space you can see that the GP7 is doing a fine job pulling the loaded coal out of Moss Mine #1. An overview of the Fremont Branch with Holly Creek and Victor Tipple with Moss Mine #1 at the end of the line. Looking at the staging area with Elkhorn, KY on the top level with two tracks for the Haysi Branch and the lower 8 tracks for Erwin, TN. Here's a picture of me....the Owner, Carpenter by trade, Dispatcher, and of coarse Web Master! As you can see I like to operate more than I like scenery. E-mail me at Clinchfld@yahoodotcom if you have any questions.